With one spin I'll admit I was skeptical. Juggernaut is a rather diverse and dark album. To the former, you'll hear a variety of influences informing the prog, including traditional heavy metal, power metal, and modern hard rock. As to the latter, the heaviness unleashed here gives the album a weighty brooding quality. The best pieces are the bookends of the title track and the revamped instrumental Arrythmia, from 2002's Entropy. What lies in between is best appreciated with repeated listens to formulate an opinion. First time through, I found these songs to be interesting but adequate prog metal. However, if something would have distracted me at the time, I probably wouldn't have thought I missed anything important. Given a second spin, and despite the foreboding weight, the music began to resonate with me, with favorable nods to Ruffian, Cut Me, Burden, and Insurgent. All these show the continued ambition and creativity, and the talent, of the band. Yet, ultimately there's not a lot of warmth and accessibility here, and sometimes the arrangements seem rigid. Nevertheless, for heavier, darker, progressive metal with some subtle modern nuances, All Too Human's Juggernaut is a good accomplishment. 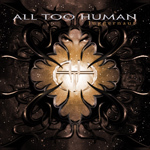 For heavier, darker, progressive metal with some subtle modern nuances, All Too Human's Juggernaut is a good accomplishment.